These days I find myself returning to simple forms of creative expression. As a child I learned to embroider and cross stitch. I would spend hours in the craft store looking over the colorful pallet of threads, painstakingly deciding which colors to choose. Which three shades of coral pink to take home? Not much has changed since I was a child. You can still find me pillaging the embroidery thread isle, trying to decide on a shade of pink. I still find immense pleasure in stitching by hand. The coarse sound of the thread as it is being pulled through the fabric, the feeling of the taught thread in my finger tips as I tie a knot. Few things in this modern world can transport me to this peaceful and pensive state of mind. 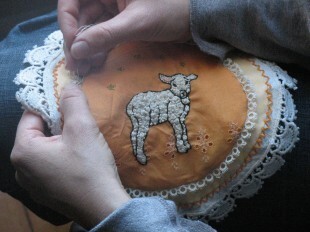 In this simple act of sewing an embroidered baby gift for my pregnant friend, I find the most pivotal clues to life. The lamb is so beautifully done, and the orange background makes it modern and fun. You are amazing! I have been missing you so much. I can’t wait to craft together soon. So well said, and such beauty comes from that “peaceful and pensive state of mind.” Your hands turn thread into love and art.